We are a leading Manufacturer of oil filter press from Rajkot, India. Diameter (Inch) 12" 14"16" 18" 24"
We are engaged in manufacturing and exporting 'Ajay' Filter Press. 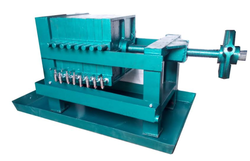 These presses are used for to filter and clarify liquids and collection of precipitates or solids. The liquid is pumped into the press and pass through the central hole, which further fills up all the chambers. When the pressure shows an increase without much discharge, it is indicated that the press requires to be opened and cleaned.